As we mentioned earlier, Jimmy Carter, who honestly thinks he is making a better job as ex president than what he did as president, said Venezuela has the best voting system on Earth. It's because of the paper trail and the fancy "voting machines". In the picture above you can see a couple of the hundreds of PDVSA - i.e. 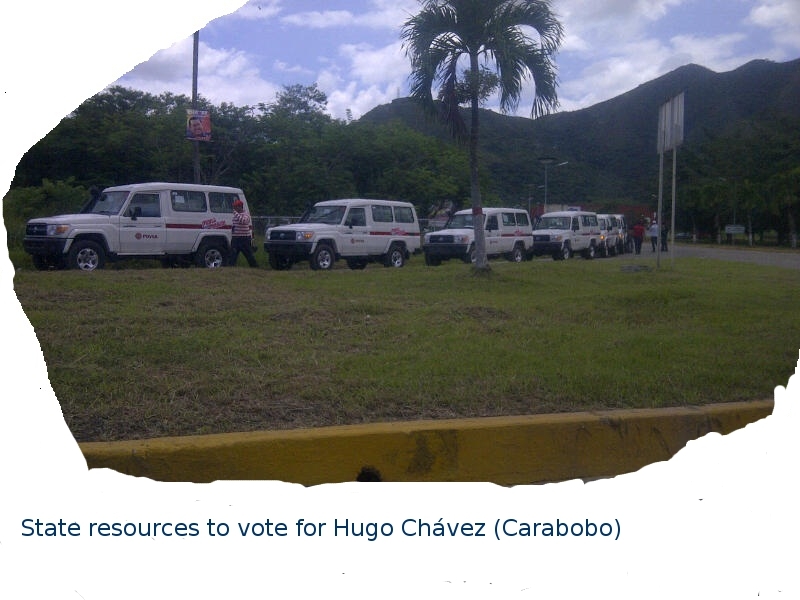 state- vehicles that were kept for weeks at the PDVSA petrol distribution centre in Yagua, Carabobo. This picture was taken when state officials were about to distribute those vans all around Carabobo and neighbouring states for general campaigning and above all for the election day, when state employees and the military case will be involved in taking possible Chávez sympathizers to vote. Although the opposition has repeatedly said the print machines used in Venezuelan elections are not connected to the voting machines proper, many people are not sure about that and fear the government can find out about their voting decision once they put their finger for scanning and go right away to the other machine. This is another obstacle democracy has to face now. This is the kind of tricks the BBC journalist does not report about because she is basically interviewing people in Caracas, thank you very much.